Assigning a meaning and interpretation to the decline in mathematics achievement scale scores over eight years is more difficult. As indicated in Exhibit I.3, the racial composition of the MMSD changed over this same period from about one-third minority students to nearly one-half minority students. MMSD Mathematics Task Force Report, section 3, page 7. In the middle of a discussion of declining achievement, after a warning that this trend is difficult interpret — bang — a “helpful” reminder about the growing minority population. Talk about you subtle invitations to insert your favorite crap about race and intelligence. Shameful. Disgusting. 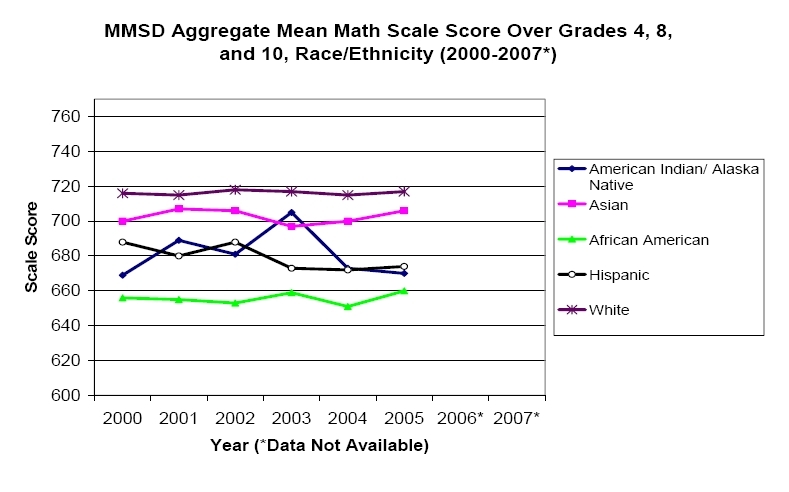 Look, we all know that achievement gaps are a reality but this is not the way to discuss or present that information. It might be OK is it was followed by some discussion of why these gaps exist and what can, (should and must) be done to address the gaps. 8. In making improvements and investing resources, the district should consider how best to reduce the large achievement gaps among subgroups of students. If I’m reading the charts right (the presentation leaves much to be desired), low income 10th graders score below non-low income 8th graders. They are over two years behind. This and other achievement differentials deserve serious attention. Instead the Task Force gives us colorful charts and an invitation to racism. Somewhere the lessons about high expectations leading to higher achievement have been lost. 1. Schools will be excellent only when students of all economic and demographic groups are achieving at high levels. 2. Schools should reflect fairness and high expectations for all learners. Somebody should have told the Math Task Force these things.